This stylish bracelet has been completely formed, fused and hammered by hand, using the finest Silver available (99.9% pure). It features a "Sweet Heart" in between various sized circles. 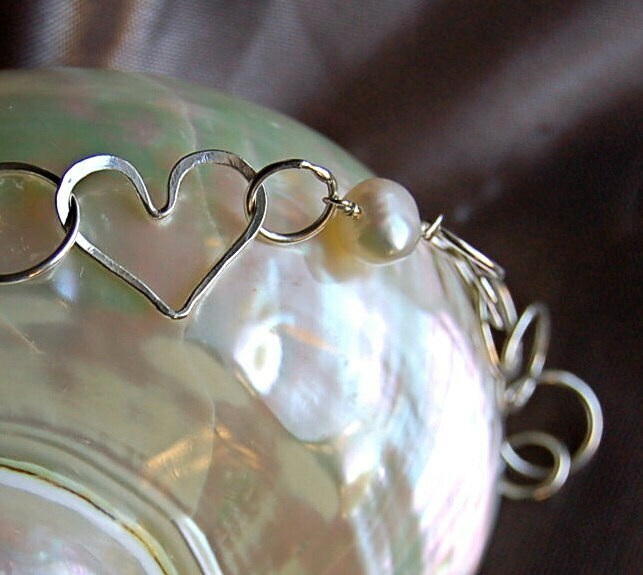 A Medium sized white freshwater pearl has been hand wired into the piece for a nice balance with the fine silver. Hammered for an interesting texture. This bracelet is adjustable up to 8"; the sterling silver lobster claw clasp can be hooked into any of the ending links. This bracelet is made to order and may vary slightly. If you desire a specific length, please indicate with your payment.